Two of the great lessons of my life have been to get inside of myself and to get outside of myself. What do I mean when I say get inside of myself? I have realized, sort of consistently over my life, that I have a great need for solitude. I do need to step back from things on a regular basis, have some solitude, re-energize, and get new perspective. We read over and over in the Gospels that Jesus went away to a lonely place, or Jesus went away to a quiet place, or Jesus left everyone behind and went away to be alone or to be apart. We need that. You need that. I need that. Whether we’re extrovert or introvert, we all need that. The role of solitude in our lives is very, very powerful. I talk a lot about clarity, and the idea of clarity, and personal clarity, and working out who we are, and what we’re here for, and what matters most, and what matters least. Silence is very important to helping us develop that personal clarity. 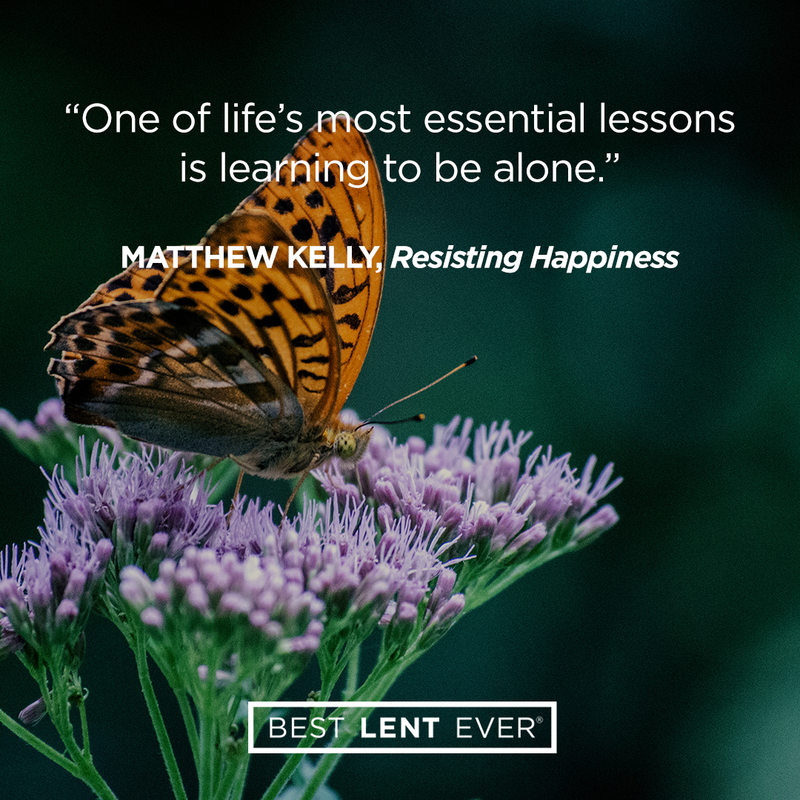 But solitude is also very, very important to helping us develop that personal clarity. When we have time in solitude, we learn to hear our own voice very clearly, we learn to hear the voice of conscience very clearly, and we learn to hear the voice of God very clearly. And in order to get that kind of clarity, you need solitude. So create some solitude for yourself. Today. Tomorrow. Go somewhere quiet. Go for a long walk in a quiet place, or just go somewhere solitary and just sit there for an hour and see how it affects you. See what it says to you, see how it makes you feel. So I’ve worked out that it’s important for me to get inside myself. The other lesson I’ve learned is that it’s important for me to get outside of myself. And the only way to get outside of myself is to serve other people. When I’m unhappy in life, mostly it’s because I’m too focused on myself. When I realize I’m unhappy in life, I’ve developed sort of a trigger: I just have to get outside of myself. I have to do something for somebody else as quickly as possible, because it gets me out of my self-focus. It gets me outside of my self-interest. It gets me focusing on somebody other than myself. From time to time, we do get all caught up in ourselves, and I really believe the fastest way out of that is to serve others—get outside of ourselves, focus on someone else, serve somebody else, in whatever way is available, however simply and quickly you can do that. But also, I think the realization is that we need this on a regular basis. Because if we’re not getting outside of ourselves and serving others regularly, we tend to fall into that unhappiness of self-focus. 1) Get inside yourself. Work out who you are by spending some time in solitude. Get clear about the most important voices in your life. 2) Get outside of yourself. Find ways to serve other people. Few things will bring you more joy in this life than serving other people in powerful ways and in simple ways. We keep resisting God even after we are convinced that his way is the best way. Visit the lonely. Somewhere not too far away from where you live, someone is saying a prayer. He is asking God to send someone to visit him and lift him up out of the depths of his loneliness. God wants you to help him answer that prayer. God, help me to dive deep into solitude, especially when I don’t want to. Help me to learn more about myself and about you, and inspire me to reach outside of myself to those around me. Today’s personal reflection features Dynamic Catholic team member Melissa Gillie. Melissa is our Mission Team floor lead, coming to us from Escondido, California. Melissa once won coffee for a year, is notorious for winning radio contests, and greatly enjoys playing Scrabble. Have you ever reached out to someone who was lonely?